In order to execute a personalisation strategy, the more you know about your audience, the better you’re able to engage and tailor your messaging. Next to profile data flowing into Eloqua from your CRM or other data sources, information captured via a form submission, is the one point where your prospect or customer is in direct control of the data you receive about them. Eloqua form capability, either used in concert with Eloqua Landing Pages or not, can deliver a unique experience at each point of contact. What do you know about your contacts today? Eloqua’s segmentation functionality is one way to look at the quality of the data you have in Eloqua. If you have administrator access, you can also look at the actual data in a field across the entire database. Click on the Field Population Details “VIEW” button once you’ve selected the field you want to inspect. Eloqua will only show you up to 1,000 variables. e.g. looking at First Name will not serve you well, however looking a field like “State” is helpful. Where does your profile data come from? The image below shows the Eloqua contact at the centre surrounded by multiple data sources delivering various types of profile data to the Eloqua contact. Through field merges where you insert specific values into a sentence. It’s clear that in most cases, access to data is not the problem, it’s having faith in your data that is the challenge. You really need to move from having “faith” in your data, so having a sure “knowledge” of the accuracy of your data. When using field merges to personalise data Eloqua requires you to have a “default” value. Remember you can create as many field merges as you need, the secret is to never edit an exisiting field merge – you could completely mess up another campaign. Always create your own field merges if the behaviour of the field merge does not match your campaign requirements. The more you know about your prospects, customers & partners, the better the conversation can be. 2. Exploit Profile data & Digital Body Language™ to drive a more unique CX while enhancing your contact profiles. How do you do this? Well, you need to lift your segmentation from excel spreadsheets and use Eloqua to build your audiences. Using segmentation within Eloqua allows you to easily combine both profile and digital body language data to build your audiences. You will find trigger based campaigns and “always on” campaigns much easier to manage if your segment is built in Eloqua. Relying on manual uploads via excel, will never quite deliver the automation you have available to you. 3. Carefully think through the design of your forms & deliver enhanced profile data. While it’s pretty easy to build an Eloqua form, a little more thought and an understanding of the processing steps, can dramatically improve the quality of the data you capture and improve the experience of the person submitting the form. 1. The form above is extremely basic and misses some of the key functions of Eloqua. While the yellow highlights text indicates pre-population of the form, they’re not the right field merges. There are no hidden fields to track source information and there’s no progressive profiling. 2. This second form shows smarter use of field merges, it includes progressive profiling and also hidden fields (The two Lead Source fields) and takes advantage of button changes i.e. you can add a .jpg image to your form to assist with more on-brand looking forms. Our suggestions to help you achieve better data capture across multiple forms. To help deliver a more consistent customer experience and ensure continuity in the way your data is processed, we suggest developing a series of form templates. If each time you need a form, you’re starting with a blank form, you’re already a little behind the eight ball. While you may need many forms for various campaigns, it’s likely that the forms fall into a few primary categories. 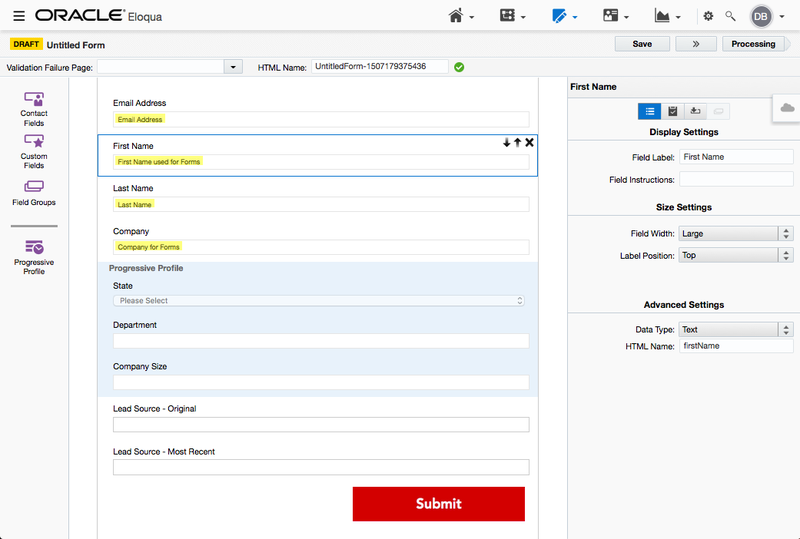 By using Form Templates, not simply “saving-as” a previous form, your Eloqua users will have a much better experience and you will deliver greater consistency across your campaigns. Our experience shows that Eloqua users who do not use progressive profiling in Form Templates, will probably not use progressive profiling. Changes to the primary navigation menus, mostly cosmetic in nature. The new navigation is icon based and now includes a duplicate menu as a slide out on the left hand side of the screen. User can trigger notifications to the Notification Centre when a contact reaches a Wait step on the campaign canvas. Helpful for always on campaigns and more. Users can now trigger an email notification emails 1, 2 or 5 business days before a campaign end date is reached. Also helpful for longer running or always on campaigns. Keep in mind, all campaigns require an end date. A new Landing Page Dashboard is available from the analytics menu. Eloqua Release Update # 491 September 2017	Are you Surprising & Delighting your customers?